Time to beat a few Personal Bests! It’s been a couple of years now since l realistically targeted venues that contain the stamp of fish that could possibly break a few of my old standing personal bests. To be honest my guiding has taken over, unbalancing my hobby with work and now that its been noticed, l have intensions of getting back on the bank and doing what lm good at, putting a few oversized specimens on the mat. Over the last couple of weeks l have made time to do just this, ignoring the easy option of catching lots of fish on overstocked commercials, for the difficult job of visiting rock hard venues. It takes time to learn these venues time, effort and sheer determination is required if l am to raise a few eyebrows. Its early days at the moment, and looking at the next couple of weeks going to be difficult to find much time, yet this is how things have gone so far. My first target was crucian carp and although some may think it’s a bit late in the year now, l find that these go on a feeding frenzy in the autumn, yet timing my arrival with this can be tricky. Targeting a ten acre mature lake l have managed to put three late afternoon and into darkness sessions in. Using what l call ‘The groundbait lead’ where finely sieved Sonubaits Super Crush Green is compressed around the lead and sweetcorn used on the hair, next to a size 16 hook which is placed on a short four inch hooklink. Holding the groundbait ball next to the reel, all l do is swing this before setting the bobbin. If nothing happens in fifteen minutes the process is repeated. Over the three session’s l have taken just two crucians, one around 2lb plus one of 3lb 9oz, just eleven and a half ounces of my best. Although on one occasion l had crucians all over the swim, my feeling is they have either already finished their frenzy or lm to early, so lm going to leave these for a week or two. 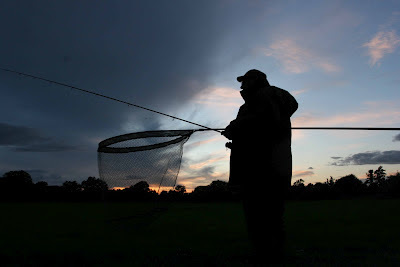 Another species that l always target and love fishing for are eels and recently l spent a night under the stars making a video for Coarse and Match Fishing Monthly. Before the sun had set l put a good eel of 3lb 12oz on the mat, yet the rest of the session failed to produce any more action. If you haven’t already viewed this online fishing magazine then take a look as it’s full of great shows. One personal best that l would love to break is barbel. At the moment my best stands at 16lb 10oz, one that has stood for nearly eight years and with venues capable of producing one bigger slowly disappearing in the south, feel that there is no better time to start looking. Its still a bit early to catch a real whacker, yet l have spent three short sessions on one such stretch, more to get a feel for it, find some swims that l can place a bait within and see what the pressure from other anglers is. These three sessions have totalled thirteen angling hours and have covered no less than twenty swims. Some swims have been visited more than once and only one swim has produced bites. The first could have been from a barbel, yet lm consoling myself that it was a chub as the hook pulled shortly after feeling the fish. The second bite came from what surely looked like a chub, yet the power and way the fish thought had me guessing right to the end. When the chub went in the net l wasn’t that concerned on its size as barbel were my main target, however this fish seemed to grow every time l looked at it. Lacking the depth of a winter fish, this chub was longer than any l have caught before, a true monster if it ever fills out and on the scales it went 6lb 13oz, my second biggest chub ever. I have also been pre-baiting a lake with particles over the last week in the hope of catching a big grass carp. The water has produced a couple of forties this season so tonight’s sessions is one full of expectation. Unfortunately it seems that l have been feeding the wildfowl as soon after spombing more particles out flocks of every bird imaginable turned up and started to dive over the spot. Darkness bought some respite but come morning and after just two bleeps they were back, proving that the desired target hadn’t visited the area. Time for a rethink! I still have Wednesday 10th October free for a maximum of two anglers to fish the fabulous river Wye for barbel. Fishing is on a very scenic and exclusive stretch of the river in between Hereford and Ross and last month we caught 65 barbel and 45 chub in just five days. Cost per person is just £125 which includes bait, terminal tackle (rods and reels if needed) plus ticket to venue. Don’t worry if you are on you’re own, the cost will still be £125. The predator season start in just a few days and October is without a doubt the best month to catch a bumper bag of zander at Old Bury Hill fishery in Dorking. My guided trips include bait, terminal tackle (rods and reels if needed) and the privilege of fishing well into darkness, the best time to catch. Last season l helped numerous anglers catch personal bests, many far bigger than my best of 12lb 13oz. Tony Bickley had never caught a zander and on his very first trip caught plenty to a best of 12lb 6oz, Mel Smethurst took two doubles, again part of a multiple catch which included fish to an amazing 14lb, young Jake Curry smashed my best with zander to over 13lb taken on sardine, a catch that also included carp and pike well into double figures and as for Mark Forshaw, who can forget him catching a lake record of 16lb 2oz! Early October the Lower Itchen Fishery opens its doors to coarse anglers offering miles of fantastic fishing in idyllic surroundings for big grayling along with the chance of a big roach, even a barbel. Predators such as pike are always around and brown, rainbow and sea trout as well as the odd salmon will always keep the rod bending. Bait and tackle is included within my costs, however spaces and days are limited and need to be booked in advance, so if you fancy something different then get in touch and we will book a day of one of the best chalk streams in the south of England. Contact me on my mobile – 07928 617006 or email me if you are interested. Gardner 3 season Crash Bag. The problem with most sleeping bags is without a doubt the quality of the zips, usually breaking or the bag splitting within a few months, however l have been using a Gardner Crash Bag now for over two years and have had absolutely no problems what so ever, and if you take into consideration the amount of times lm out on the bank and having to quickly rip the zip apart to get out, then you would have thought it would have let me down a long time ago, but you would be wrong. Made from a single layer Hollow-Fill fibre this sleeping bag keeps me warm when it’s cold and cool when it’s warm, so grabbing a few hours in bright sunshine after a hectic night is possible. It’s also extremely lightweight weighing just 1.8kg and thin enough to leave within my folded bedchair and the polyester material doesn’t stick to my clothes or body. The zips on both sides work two-way and have guards plus easy to locate cords and Velcro retainers to enable a quick exit when needed. Being cocoon shaped it retains heat and the draw cord around the hood reduces heat loss and the shoulder and zip baffles eliminate draughts. Although only classified as a three season bag, l have fished through some very chilly nights, rarely having to add a fleece over-wrap to it. All in all a great product, one that will last and one l highly recommend. Trial period – two years plus. Last winter Mark Cathcart travelled down from Herefordshire in search of his first double figured barbel, yet the day dawned bright and after searching the river intimately just one chub graced his net. I promised Mark a return visit, free of charge, as l knew how much he wanted a double, however our planned trip coincided with the first grass frost of the year and with a chilly North West wind and high atmospherics things once again looked bleak. Arriving later than we would have liked, we found an angler already set up in the one swim that’s been producing this year, so moved downstream to another that, although has proved difficult this season, has a track record of producing doubles. Stealthily dropping a bait under an overhanging tree that created shade we sat back shivering unaccustomed to such a cold start. Fifteen minutes later though the cold was forgotten as the tip pulled round and Mark found himself attached to a barbel that headed downstream under the trees. I must admit l expected a double to show, yet it wasn’t to be as one of the stretches smaller specimens had beaten the big girls to the bait, yet it was Marks first Loddon barbel, so all was not lost. Still suffering with a skin complaint in my face and eyes l headed to the doctors early afternoon leaving Mark to rove around the river in search of his dream, yet it wasn’t to be. I’ve promised to keep Mark informed on how things are going and if l think there is a really good chance of a double will once again invite him down and likewise Marks going to keep me informed of any pike of dace sport up on the river Wye. Already looking forward to catching up with him soon. September has arrived and although the days have been warm the nights are cold and with the weed beginning to die back and the water temperature dropping it seems its been a wake up call for the barbel that have, at last started to feed on our rivers. It was a shame that a customer lost a very big fish earlier in the week, yet our determination paid of with a near double, however my latest customer, Ron gave me a real challenge as unable to rove around in the normal way, l had to locate some swims, very close to each other with a few close options. Instead of fishing the whole day, l suggested that we fish two afternoon to dusk sessions in the same week, the first being on Tuesday. Arriving at 2pm we headed to a swim that, although l know contains barbel, seems to only produce after dark. Casting the pellet lead to showing gravel on the far bank we sat back and waited. After an hour nothing had happened but river work upstream saw the river colouring up and my confidence rose. Soon after the tip bounced round but the strike met thin air, a crafty chub l suspect. A swim downstream is usually difficult to approach in bright sunshine due to your shadow being thrown across the river and being very shallow the fish normally see you before you see them, however the coloured water created an opportunity not to be missed and after a few minutes Ron found himself playing a three pound chub. Moving to another swim it took around fifteen minutes for a three-foot twitch to happen and Ron found himself to his first Loddon barbel, not a monster but a barbel weighing 5lb 9oz. We could have moved but a barbel strangely hitting the surface made us stay and as we watched the tip were fortunate to have a kingfisher land in the tree just a couple of feet from us. The signs were there that fish were around and as dusk descended the tip bounced round in true chub fashion, yet they had the last laugh as both were missed. Three bites in just a few hours on the Loddon in bright sunshine, rare! We were back on Friday in great weather, albeit not brilliant for fishing. Rotating the same three swims we failed to get a response in the first. The second is what l call the banker swim and after dropping some bait in whilst fishing the first swim we made our way to it with expectation. Fifteen minutes past before the three foot twitch came and once again Ron found himself attached to a barbel, yet once again it wasn’t from the wished for monster, but one that weighed 5lb 5oz. Moving to the last we decided to sit it out till dusk as this swim gives the best opportunity of a real specimen, yet the tip moved just twice, the first from a minnow that had speared itself onto the hook and the second from an over enthusiastic roach of around 6oz. To land two barbel in two short afternoon session was a real result and proves that you don’t have to fish after dark to catch them. Well done Ron, you’re a natural! Well after a week on the Wye watching customers rod constantly bending, it was time for a reality check and with a new customer looking to catch a barbel or two it was back to the Loddon. Meeting at 8.30am we found another car in the car park and with only one swim that l was confident of catching from was gutted to find this angler settled within. My first impression was that he must have known about this swim, l call it the jungle as there’s only a small hole in the bankside vegetation to push a rod into and land fish. Unfortunately another angler had ripped the vegetation to pieces and made the swim stand out a country mile for others, so from the off l found myself on the back foot and when the angler asked for a picture of a barbel he had caught l felt that this should have been ours. We tried a number of swim, including the jungle, where we watched as chub drifted in and out under the far bank willows but our efforts went unrewarded, so we headed of downstream to a banker swim, well last year it was, yet this year none can get a bite from it. I knew some time that the fish would start to group here and after fifteen minutes the tip flew round and James found himself attached to a big barbel, however after doing the hard work and keeping it from going to far downstream the rod suddenly swung back and she was gone. James had seen the fish and knew it was a big one and l felt his disappointment deep in my gut. Other anglers had arrived so after a late lunch we headed to another stretch, yet after covering five swims in a known area the tip failed to move. Having a couple of hours left before dusk we headed upstream to a couple of my favourite swims and soon after dropping the ‘pellet-lead’ in the tip once again flew round. James once again found himself playing a barbel but after a few seconds it headed upstream and snagged him. It looked like it wasn’t going to be our day, yet after some gentle persuasion he managed to get her moving and finally l drooped the net under what we thought was going to be a double, however the scales had other ideas and settled on 9lb 7oz, a new best for James. We could have gone home at that point but James wanted to try the other swim, one l call ‘the five pound chub swim’ and within a few minutes was holding a chub of exactly five pounds! Effort equals reward and there was plenty of effort in the session and we got the reward. Here are a few words from James…I found the day very enjoyable and feel I got a lot out of it. The main things that I gained from the day was the confidence in setting up rigs with the knowledge of why rigs are set up in a certain way and also how I should approach a river when targeting Barbel. By hooking 2 Barbel and a Chub I now feel confident to go in search of some Barbel my self with full confidence in what I am doing. Duncan was very knowledgeable and there was plenty of time to pick his brains and get some great information from him. The day was made all the better by being on a fantastic looking venue and a great place to be. When Korum informed me that they were to discontinue the S3 range of hooks l was gutted, as l have had absolute faith in these for all my specimen angling, especially barbel. Fortunately whilst at a Korum product meeting most of the other consultants had the same feeling, so it was agreed that we needed to create a hook similar to the S3. Whilst these were in production l stocked up on S3, especially size 10 and 8 as rarely does a superseded hook match the former, yet l needn’t have bothered as when a packet of the new Xpert Power came through the post l was instantly impressed. These new hooks still had the same in-turned beaked point, wide gape, short shank, non glare qualities and most importantly the razor sharp chemically sharpened point. Available in both barbed and barbless, through a size range from 16 to 6 (slightly oversized) they are as good, if not better, and once again l can fish with total confidence that my hook is as good as it gets. River Wye – One day left! I still have a day available for two anglers to join me on the River Wye on Wednesday October 10th. As you can see last week plenty of fish were caught and lm envisaging the fishing to get better as the cooler nights and hopefully some water gets into the river. Cost for the day is £125 per angler and this includes tickets to the venue, terminal tackle and bait. I’m expecting this date to go quickly so get in touch as soon as possible so not to be disappointed. Sixty five barbel for the week! Having spent a number of days roaming around the banks of the river Wye in the Hereford country side, l finally decided on a private stretch of river midway between Hereford and Ross-on-Wye. My choice was based on a number of factors, the first being the sheer beauty of the stretch. I was also able to drive the car along the river bank, so no long walks for customers. The fishing was also meant to be good, and although the size of the barbel may not be as big as on other stretch, the beat did have a famous pool on it, one that could be booked in advance, and was an almost guaranteed to provide whoever settled within it and rod bending day. Another point was the beat had no other guides working it, so l wasn’t going to upset anyone and felt that the results would be based on my sheer hard work during the week. Sunday evening the car was packed, albeit after a junior barbel teach-in for Farnham Angling Society on the river Loddon. With every eventuality covered, from rods ranging from 1.25lb T/C to 2.75lb just in case of heavy rain in the welsh mountains or if a big pike showed, and feeders ranging from 1oz to 5oz l finally hit the road, early Monday morning. Half way to my destination the mobile range, it was my brother who had lost his keys. Thinking l might have chucked them in with my gear l had to stop the car, unload all the kit on the side of the road and carefully hunt through everything. After not locating them l was further on into the journey when a text came through that he had found them, however l was now fighting for time, as l had arranged to meet my first customers at 9am. Arriving at 8.45am things seem to be going to plan, yet l then lost my mobile phone, which was later found by Jakes mum, laying in the car park at Sink Green Farm, the B&B l was staying at. Although the weather was looking great, it wasn’t exactly brilliant barbel conditions and after thinking hard for a while l decided that if my customers were to land fifty barbel for the week then it would be classified as a resounding success. After meeting Jake and Kevin at the farmhouse we finally arrived at the river around 9.30am. No other anglers were around and with the same two anglers booked in for two days it seemed only fare that we place young Jake in the banker swim. The sun was hot and my thoughts were that it would be tough, yet after setting Jake up l filled the feeder with some Sonubaits Hemp & Hali Crush, placed two 8mm Pellet ‘O’ on the hair and cast to where the river keeper had told me two. Paying out a few yards of line l was amazed, as were Jake and Kevin, when a few taps signalled a bite. I hadn’t even had time to put the rod in the rest and the first fish of the week dropped into the net, a chub around three-pound. After helping Jake land a couple of barbel, Kevin and l headed to the top of the beat, an area of relative unknown, yet not far from a famous angling landmark, the old railway bridge supports that sat out in the river. With Kevin settled l headed back to see how Jake was getting on and with a couple more chub and barbel landed he seemed in his element, yet he seemed to have lost far more than he had landed, due to cut offs and snags. The river-keeper confirmed that the swim was snaggy, yet after a few hours Jake had located where these were and was starting to know the swim and land a high percentage of his fish. Spending an hour with each customer, l was soon back sitting with Kevin and as l watched his rod bent over and he was into a barbel, yet the fight lasted just a couple of seconds before the hooklink parted. An hour past without any more signs, so Kevin moved into a lovely looking swim whilst l headed back to see Jake. He was still catching, however the fish had become somewhat cagey and thinking they had backed of l asked if l could make a longer cast downstream. Jake was using my tackle which made the somewhat tricky cast easier for me and the Korum Neoteric XS 12ft Multi-Quiver Power easily launched the 3oz feeder into position. Placing the rod in the rest l counted six seconds before the tip started bouncing and Jake was back in. The next cast took ten seconds! Unfortunately the phone signal isn’t very good on the river and Kevin was unable to get in touch to say he had just landed a barbel weighing 7lb 12oz along with a few chub. Happy to keep on the move, Kevin continued to try new swims and although no more barbel came to his rod, the odd chub kept his interest. Jake was exhausted come the end of the day and had managed to bank a total of eleven barbel, the best 7lb 2oz along with eight good chub. Although the day was a great result, l was concerned with the amount of fish being lost. Braided hooklinks in a snaggy swim isn’t very swim-friendly, as if the angler has to pull for a break, the line could go anywhere, leaving at most, around thirty yards of line in the swim. Pre-stretch mono was what we had started on, yet on occasions it was as if someone was cutting the line with a pair of sharp scissors, so this wasn’t very fish friendly, especially taking into consideration we were using micro-barbed hooks. To say l went to bed with the brain ticking over is an understatement, yet l found the solution the very next day. Having made a late start the previous day, we were all on the river early. Kevin took the banker swim whilst l set Jake up on a comfortable salmon croy which extended well out into the river. The weather was once again hot with bright blue skies and a brisk south west wind. I was hoping that the problem of lost fish would be reduced today and had changed the hooklinks to Korum Green Power Mono in a breaking strain of 8lb. Straight away it seem to work as even when a snag was hit, it was able to slacken off, let the fish swim out and regain the fight. Even if this didn’t work, steady pressure seem to eventually get them moving and although the hooklinks on many occasions had to be changed due to fraying, at least the fish was landed. Kevin was expecting to be instantly into fish, yet he had to work for his fish which came constantly throughout the day. Reluctant to pack up late in the afternoon, he finally ended with 13 barbel to 8lb 2oz along with the odd chub to 5lb 8oz! Jake amazingly also found the fish in an obliging mood and l have to say l was well impressed how he stayed focused all day. Obviously no river scares this young angler and he conquered a mans river like a man and ended the day with seven barbel to 7lb plus plenty of chub. What l think Jake will remember is the countless salmon that constantly leapt clear of the water in his swim. He even tried a small plastic lure in the hope one might grab it or a big pike might show and whilst he cast away l took the opportunity to catch the odd barbel from his swim. Both anglers left late afternoon, so the tally could have been far more, yet this gave me time to head back to the B&B to meet my next customer Alan. After a full English breakfast we were met by Pav who would be joining Alan for the day. Arriving at the river in once again bright sunshine, it was obvious that the river was dropping and the colour from Monday had rapidly disappeared. A strong, chilly easterly wind was also blowing and my thoughts were that this could kill the sport, yet l needn’t have worried. Pav was only with us for the day, whilst Alan had booked a mini holiday and would be staying till the end of the week, so we agreed to let Pav have the banker swim whilst Alan headed upstream, starting where Jake had fished the day before. Pav is a Frensham angler so we had plenty to discuss throughout the day whilst he caught barbel. He was of to a great start and set himself a target of twenty barbel for the day, yet after a dozen, they dropped back in the swim and he had to work for a further four before the day ended. Sixteen barbel to 8lb 2oz plus a few chub certainly isn’t a day to grumble at. One item of terminal rig kit that l found extremely useful when fishing the Wye are Korum large Quick Change Beads as these make changing hooklinks quick and simple. Just a word of warning though, always check your knot after tying on a Quick Change Bead, and don’t use a six turn blood as these don’t bed down well, a grinner is far more reliable. Alan initially started were Jake fished the day before but only managed one small barbel so feeling that the fish may have dropped downstream moved a hundred yards or so and was soon bent into a fish. Come 7.45pm he had landed a further five barbel to 7lb 4oz which included a brace right at the end. Another glorious day with temperatures rising to the high twenties and once again the wind was present, this time coming from the south west. The river had dropped around a foot since arriving on Monday with very little colour l expected the fishing to toughen up. Alan dropped into the banker swim and leaving him with plenty of traces helped my new customer for the day, Mel who was interested in one of the Wye’s smaller species, Dace. Heading well upstream to another salmon croy which created a great crease to trot down, Mel was soon catching dace but unfortunately they weren’t the size he desired, maybe 6oz at best. Numerous spots were tried along the river but the bleak made fishing the deeper water almost impossible and with the dace not shoaled up on the shallows he had to be content with plenty of small silver fish. We did try fishing scaled down barbel tactics and small pellets on the hook, a tactic that had previously rewarded myself with dace to 10oz, yet the only bites he received were from barbel. One was lost the other three landed with the best going 6lb 12oz so even though the dace failed to show he did return home caught his first Wye barbel. I have promised Mel a return trip to the river later in the year as l too would love to catch a big bag of quality dace. Paul at Woody’s tackle shop has promised to call me when the rivers right as well as keeping me informed when the pike become active. The banker swim was becoming difficult to fish due to the low river level. The barbel were also becoming less aggressive and instead of the expected aggressive pulls seem to just pluck at the bait, however Alan still managed to land seven to 7lb 4oz. Alan was my only customer for the day and with six other anglers on the beat we were expecting one to be settled within the banker swim, yet it was free. Knowing one might want to drop into this later in the day we headed upstream yet with a cloudless sky and temperatures reaching almost thirty degrees and absolutely no wind the river fished hard. I even cast a rod out for a couple of hours in the hope of locating a few barbel for Alan, but apart from one half hearted bite failed to score. One of the highlights of the week was whilst standing on the croy talking. We heard a loud noise and watched as two RAF helicopters flew along the path of the river and right over our heads at probably no more than forty feet. It was obvious the low clear river and bright conditions were making the barbel fishing tough so in desperation we headed back down to the banker swim where Alan managed a couple of barbel on Peperami before calling it a day and heading home. Well what a week, sixty five barbel landed along with forty seven chub, l can’t wait to return. With an overnight temperature of just seven degrees in August and a chilly brisk north east wind, things were always going to be difficult. James and Thomas are my girlfriend’s sister’s children and it’s always a pleasure having them, plus granddad along and the banter starts almost immediately. I wanted the lads to try a new method, the pellet waggler as this would get them casting a feeding constantly, something that’s so important with most types of angling. I arrived around half an hour before the boys and had a few minutes myself. Somewhat dubious as to whether l had bought a tactic that wouldn’t work due to the conditions l was soon reassured with a couple of carp and a bream. Last time we all went out l sat with James, so today we swapped round and l helped Thomas who soon got the knack of casting, and realised that brute force and speed doesn’t pay, eventually getting into a nice rhythm along with even feathering the cast so the bait lay straight behind the float. Out came the catapults in went the pellets and along came screaming clutches and bent rods. After numerous carp to around 10lb the swims, venue hit a lull and although the odd carp came between this time and 2pm, we knew that it would be tough till 6pm when they usually switch back on. I have to say it was a really enjoyable day, in the company of two great lads that love each other to bits and respect those around them and l look forward to the next time they ask if l can take them out.